"It's very special because everybody is Jewish," says Sophie Klooster from Holland, one of the 9,500 athletes visiting Israel. You may have seen her face displayed on banners throughout Israel. 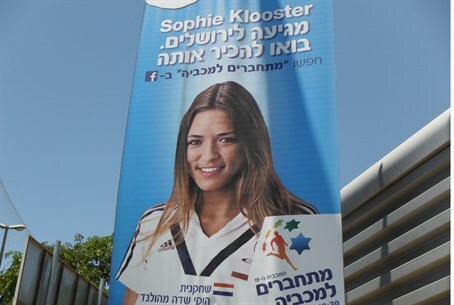 Sophie Klooster, one of the over 9,500 Jewish athletes from 42 different countries, spoke to Arutz Sheva news about her participation in the 19th Maccabiah Games. She and a select group of athletes are currently being displayed on banners and billboards to advertise the event. This is the largest ever Maccabiah Games, a series of sporting event for Jewish athletes that takes place every 4 years. Klooster is a 23-year-old field hockey player from Holland. She spoke to Josh Hasten on Israel National Radio's Reality Bytes podcast about her visit. For streaming audio of the interview click here. "It's very special because everybody is Jewish," she stated. "You have a connection with sports and what it means to be a Jew -- to meet each other and speak about it." This is Klooster's third time participating in a Maccabiah Game, and her second Maccabiah in Israel. She and her fellow poster athletes made a special visit to Israel before the games for a photo shoot. As far as her particular sport she commented, "Field hockey is very big in Holland, but nobody really plays it much here in Israel." "We are training almost every day during the trip," she added. Her favorite memory so far during the visit was the massive opening ceremony in Jerusalem which took place on July 19th with over 30,000 people, parades, fireworks, music, and speeches by world leaders. The games include professional sporting events such as gymnastics, martial arts, and basketball, as well paralympics for wheelchair-bound athletes and others with disabilities. The Maccabiah will end on July 30th with a special closing ceremony at Teddy Stadium in Jerusalem. Top Israeli musicians will perform including Infected Mushroom, Balkan Beat Box, Offer Nissim, T.Y.P, Riff Cohen, and Orphaned Land. The Maccabiah Games were first held in 1932. According to historians, the year was chosen specifically because it was the 1800th anniversary of the Bar Kochba rebellion. The second games were held in 1935 and were nicknamed the "Aliyah Olympics" because of the large number of athletes who decided not to return to their countries of birth. The games that year were held in opposition to the wishes of the British Mandatory government who ruled the Land of Israel at the time. Due to World War II and the Holocaust, the next Maccabiah Games did not take place until 1950. Since then, the event has been held every four years. Klooster currently plays on a professional field hockey team in Holland and works as a web designer. She expressed interest in perhaps one day making aliyah and maybe making field hockey more popular in the Jewish State. For the full interview, download the Reality Bytes podcast with Josh Hasten by clicking here.